Turkey's deputy prime minister has announced that 35 Somalis, including three children, who got injured in Saturday’s truck bombing in capital Mogadishu, arrived in Turkish capital Ankara late Monday. The blast at a busy road junction, blamed on Al-Shabaab, killed at least 276 people and wounded more than 300 others, according to Somali National News Agency, SONNA. Speaking to reporters in Ankara, Recep Akdag said that the patients, of whom 13 were heavily injured, would be transferred to Polatli, Numune and Gulhane hospitals. Earlier, Turkey's Health Minister Ahmet Demircan arrived in the Somali capital to oversee Turkish assistance accompanied by 33 staff, including a medical team specializing in emergency services, the Turkish Embassy said in a statement. 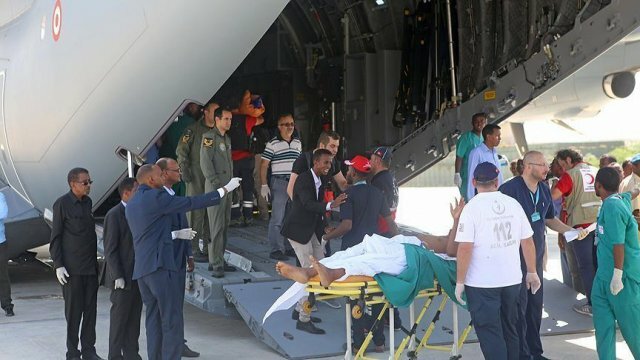 A Turkish aircraft loaded with medical aid and emergency services workers, including 13 workers from the Turkish Red Crescent and the Disaster and Emergency Management Authority, landed in Mogadishu on Monday morning. Somalia's President Mohamed Abdullahi Mohamed on Monday said during a visit to Aden Adde International Airport in Mogadishu, that his government and Somali people would not forget Turkey's help. Turkish President Recep Tayyip Erdogan offered his condolences over Saturday's attack in a phone conversation with Mohamed on Monday, a Turkish presidential source said. Erdogan condemned the blast, and reaffirmed Turkey's solidarity with the Somali people, and its support for Somalia in standing against terrorism. The Turkish president had on Sunday sent a written message of condolences to his Somali counterpart.